Know your Lightroom students within minutes. Be able to personalize your training to their needs. Personalize your courses much more easily and quickly. Analyze your students Lightroom catalog within seconds and know their usage of it. It covers many aspects, from the usage of the development tools to the camera settings during the shoot to the used camera, body and lenses. It also touches the organization with keywords, flags, stars and color labels. Each of us has his own editing habits. Some sliders we use a lot, others we neglect. This assessment will expose yours. This assessment showed Ada that she almost never used the “Lens correction” option. When its function was explained she learned how to use it. The assessment helped to improve the quality of her photos. Lets explain the assessment report by running it against a students catalog. The assessment shows graphically how often the different development tools are used. The reports starts with the summary graph of the different develop panels showing the percentage of photos that have been adjusted for any tool in that panel, see sample below. 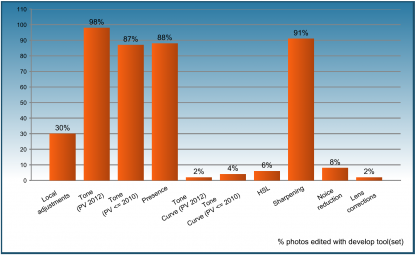 At a glance you can see which develop panels are used a lot and which not. Within a minute you already have an impression how your student is using Lightroom. The next pages show more detail. 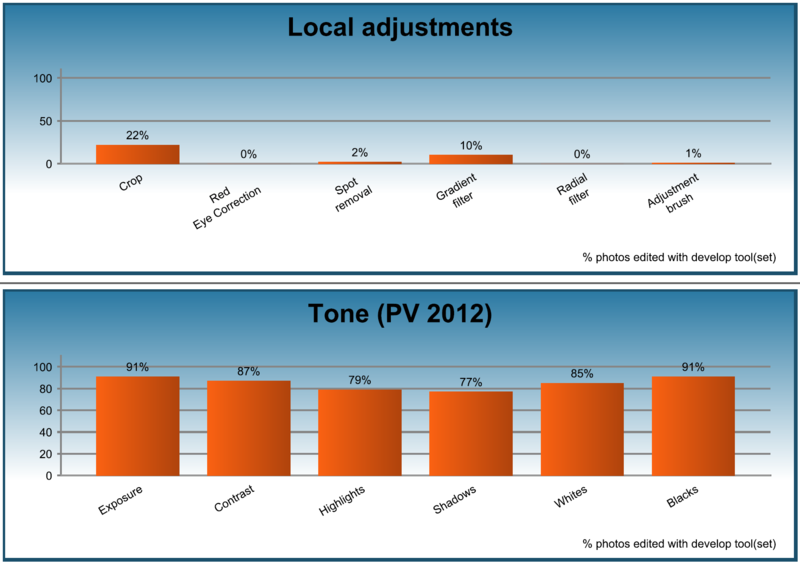 This graphs shows clearly that this student hardly uses the Tone curve, HSL, Noice reduction and Lens correction develop tools. As a trainer you might want to explain these develop tools. The following pages contain graphs of the different develop panels listing the usage of the each develop tool / slider in that panel. 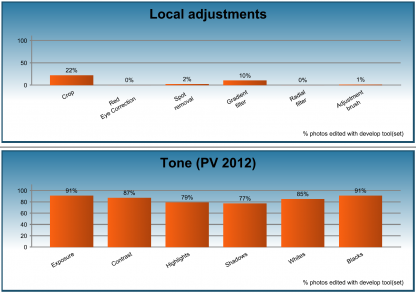 The order of the graphs matches the order of the panels in Lightroom. Zooming in on the Local adjustment tools, the adjustment brush is hardly used. Looking at the graph of Sharpening it striking is that the radius very little used. There is much more, so download the sample report. One more screenshot, the graph of the Exposure program. The setting of the Exposure program exposes the student. 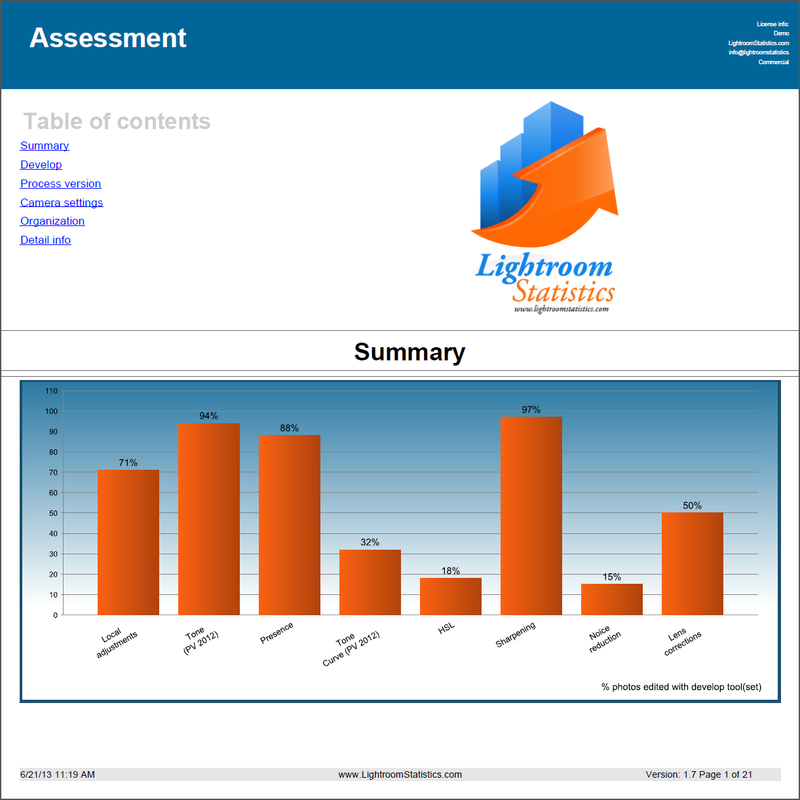 Although you can run this Assessment report against your entire Lightroom catalog, this report is meant to be used on a set of photos you want to analyze. Running the report on your entire catalog may take a long time, depending on the number of developed photos in your catalog and your hardware. Try the report first on a smaller number of photos like 2000 developed photos. 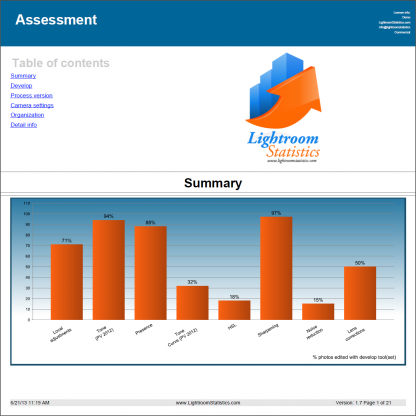 The LightroomStatistics reports can be parametrized in order to get the desired results. These parameters are described below. By the way, all parameters have a default value, so you only have to change them when needed. Description Restrict the report to the images in your Quick Collection if desired. Description The last part of the report contains detailed information about the usage of all the reported develop tools / sliders. Hyperlinks/bookmarks help you to quickly drill down to the desired information. Translations: Dutch, French and German. Contact us for translating this report into another language and get a license free.